Often it is very essential to carry out the maintenance and repair of hydraulic cylinders. Extensive and long period use of a hydraulic cylinder will result in many problems. The problem can be in piston, bore, piston rods, piston rings etc. Hydraulic cylinder repair bench is used for carrying out repair and maintenance work of hydraulic cylinders. Basically hydraulic cylinder repair bench is a tool kit to facilitate the assembly, disassembly, lubrication and to perform other servicing. SH Engineering is one of the very few hydraulic cylinder repair bench manufacturers in the world. We supply this bench to across the globe like USA, UK, Dubai, Germany, Kuwait, Africa, Saudi Arabia and many other countries. HCRB-SHE1 Hydraulic Cylinder Repair Bench provides a secure platform for disassembling, servicing and reassembling hydraulic cylinders. The HCRB-SHE1 provides hydraulic assist to remove and reinstall the piston assembly. The large amounts of torque can be generated by hydraulic power system to remove and reinstall the hydraulic cylinder. The piston nut require for max torque for removing the same way, with up to 4000kgm of available torque. Large universal high torque wrench attached to hex piston retaining nuts from 50mm to 200mm across flats. It is a hydraulically operated ratchet mechanism. 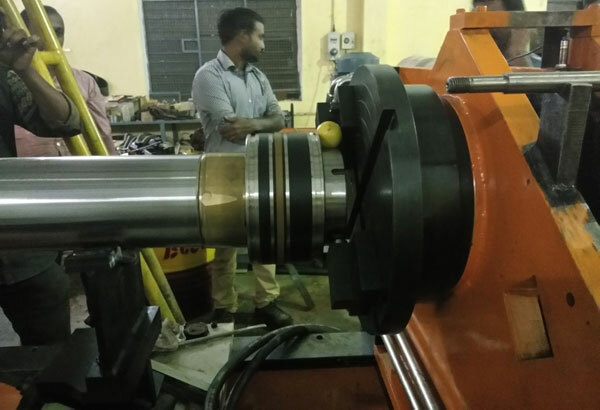 It used to remove and install the piston nut Capable of generating 4000Kg.m Torque.